Online application submission has begun for Rajasthan Police. Recruitment is open for 233 Sub Inspector and Assistant Sub Inspector posts. Candidates can submit their application before 12 December 2016 (1200hours). Vacancies are available in the posts of Telecom Police Inspector, Sub Inspector (Promoter), Sub Inspector (Technical), Assistant Sub-Inspector (Technical), Assistant Sub-Inspector (Sypher) and Assistant Sub-Inspector (Fitter). 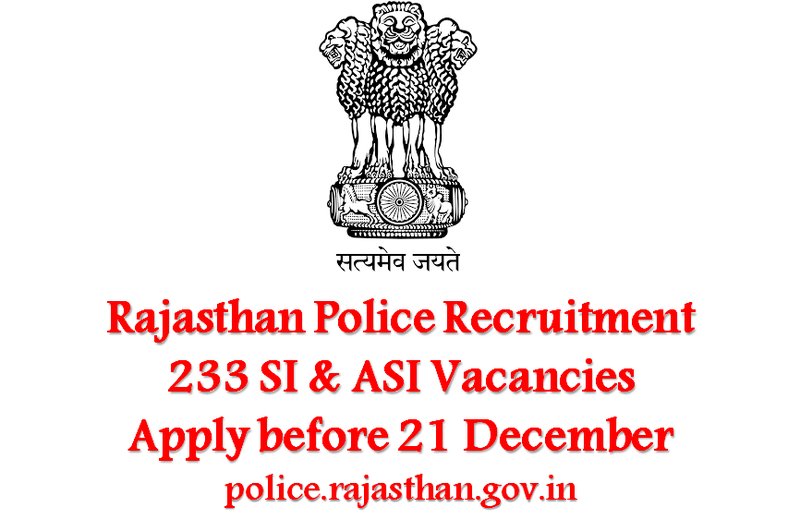 The eligible and interested candidates can apply online to the post through the prescribed format along with required documents on or before 21 December 2016.
Who can apply for Rajasthan Police Recruitment? Interested and eligible candidates are required to apply online. More details can be found from the link given below.